I know I am always writing healthy recipes and most of my readers probably think I ALWAYS eat healthy. (except for my known love for beer!) I too though crave carbs on occasion. Part of this is because if you follow a Cyclic Ketogenic diet your body will tell you when you NEED to eat carbs. When I do crave carbs though, I make sure I do it smart. I don’t go out and order the Linguine Alfredo. I eat Veggie with Pasta. 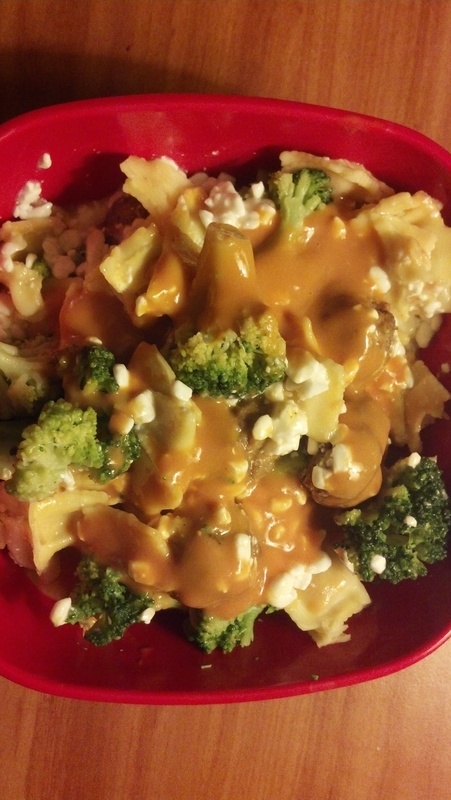 Or better yet Veggies with Ravioli (a pasta with cheese so I get more protein!) If you eat Veggies with Pasta rather than Pasta with Veggies, you will still get your carb fix, but the veggies will help will you up so you don’t overdo it on the pasta. Normally I would make homemade sauce with extra veggies and meat, but here was how I satisfied my carb cravings at Bikram Yoga Teacher Training. Microwave the Broccoli, boil the noodles in your electric kettle, top with the soup and cottage cheese and you have a carb satisfying meal that has: 460 Calories, 8g Fat, 50g Carbs, and 35g Protein.–Not bad for getting a pasta fix!